With the launch of the new Bell B45E 4x4 at bauma, Bell Equipment will add a new model to its range of articulated 4x4 two-axle ADTs. Similar to the sixty-tonner B60E and the smaller Bell B30E 4x4, the new truck is configured to provide a highly efficient and cost-effective transport solution for niche applications in the mining and construction industry. With the front half of the truck being essentially the same as its 6x6 counterpart, the Bell B45E 4x4 is derived from proven high-volume technology and decades of experience. Powering the truck is a 390 kW / 2 460 Nm inline six-cylinder engine from Mercedes Benz, optimised for off-highway use by MTU. This, combined with the Allison seven-speed automatic transmission, contributes to outstanding driving performance while delivering the low fuel consumption typical of Bell ADTs. Wet brakes on both axles ensure safe deceleration and work in conjunction with the Jacobs Engine Brake®, to provide the multi-stage programmable automatic retardation. The standard Bell cab is spacious, offering great visibility and comfort while ensuring safety and productivity. This is achieved through a comprehensive package of productivity, safety and ease-of-operation features, based on real-time data collection by the truck’s sensors (on-board weighing, pitch/roll sensor, etc.). In designing the rear chassis and the 25 m³ bin, the designers followed the design of the Bell 4x4 flagship, the B60E which has been optimised for tough mining applications. A rigidly mounted 55-t-axle supplied by German manufacturer Kessler with 21.00R35 twin tyres ensures a robust solution with a nominal payload of 41.0 tonnes. At the front the truck rolls on 775 / 65R29 tyres that boast high load carrying capacities and high lateral stability, an essential characteristic for a machine intended for challenging underfoot conditions. To improve ride comfort, the B45E 4x4 can optionally be equipped with the Bell "Comfort Ride" adaptive front suspension system. 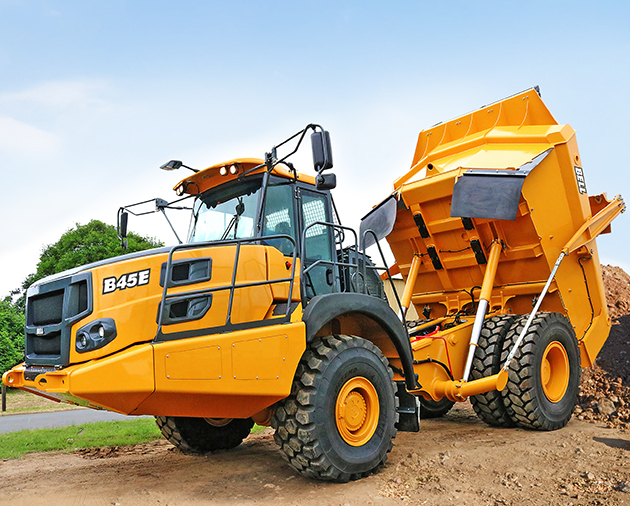 Like the Bell B60E, the B45E 4x4 bin concept is along the lines of a rigid dump truck rock bin with bottom-mounted telescopic tip cylinders. Thanks to its wide geometry and flat-bottomed floor, the 41-tonner fits in well with typical quarry loading equipment and offers better filling characteristics than the longer 6x6 ADT bins of the same volume. When carrying sticky material such as clay, optional body heating helps to minimise carry-back when tipping. Additionally, Bell Equipment has found that their 4x4 bin configuration, which doesn’t have the traditional ADT dovetail, is considerably better at minimising carry-back than their 6x6 counterparts. With a fully programmable maximum tipping angle of up to 55° relative to horizontal, the short bin body reaches a tipping height of only 6 394 mm, which can be an advantage when operating with overhead structures (for example hoppers and crushers). "Thanks to its high capacity and superior productivity, the Bell B60E can perform a supporting or primary production role in many large opencast mining and quarrying operations around the world. However, we see other target applications for the B45E 4x4," said Tristan du Pisanie, Bell Equipment’s ADT Marketing Manager. "These include small to medium-sized mining or quarrying operations with lower production tonnage as well as larger sites with difficult underfoot conditions. 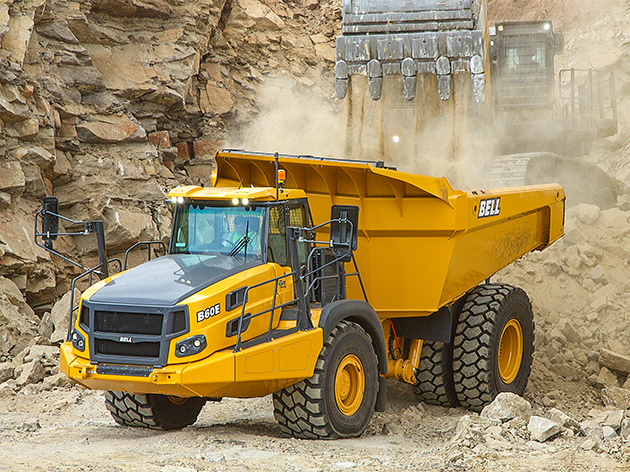 Finally, there could be operations requiring selective mining in very specific areas as a top-up on their main production volumes.” Despite a number of competitors having dropped 40t rigid dump trucks from their range, many customers in Europe are continuing to work with rigid trucks in the 40-ton class. "With comparable performance to rigid dump trucks on well-tended, dry underfoot conditions, the two-axle articulated trucks score in all-weather conditions when the haul roads deteriorate or become slippery. Additionally, the loading site is often a challenging environment to negotiate and undulations are common. The all-wheel drive and oscillation joint configuration are the reasons for this and they also provide for safer machine operation. This means that the machine is also suited to stripping or overburden work, which provides higher utilisation and improved return of investment." For today's quarry operations, with lower maximum speeds and shorter hauls, Bell 4x4s offer a more economical drive concept compared to 4x2 rigid trucks that are designed for high top speeds over long distances. "The lower fuel consumption has a direct effect on the operational costs. Another very important factor in this regard is tyre wear," said Tristan du Pisanie. "After several thousand operating hours, in direct comparison with 4x2 rigid trucks of the same size, operators reported a 65% lower wear on the rear twin tyres of the Bell B60E. Here again, the all-wheel drive and the consistent traction on each wheel ensured by the oscillation joint seems to be the difference." With regard to tyre wear on hard and abrasive haul roads, the two-axle ADT concept offers further advantages over conventional 6x6 trucks. The shorter rear chassis means 4x4s are more manoeuvrable than comparable three-axle trucks, whose middle and rear tyres tend to scuff around tight bends. This increased wear results in higher tyre and route maintenance costs as the scuffing tyres tend to churn up the road. The use of 4x4s in opencast mining requires less shunting at narrow loading points or at the primary crusher. In tunnelling or in underground mining the smaller turning circle is particularly significant: "Here, we have already successfully placed several 4x4 thirty-tonners. Specific customer requests for the more powerful B45E 4x4 prove that this derivative of our standard 6x6 machine can offer a real alternative for this very special market segment,” concludes Tristan du Pisanie. 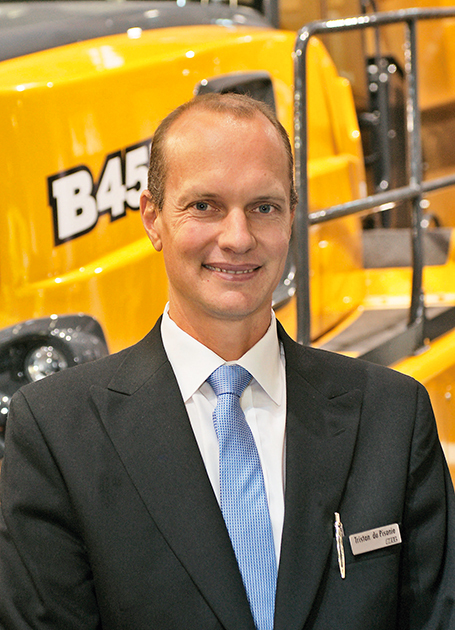 The Bell B45E 4x4 will enter the market in April 2019 following its launch at Bauma. Like all Bell 4x4s, the trucks will be produced in Bell Equipment’s main factory in Richards Bay, South Africa with the first machines planned for delivery early this summer. 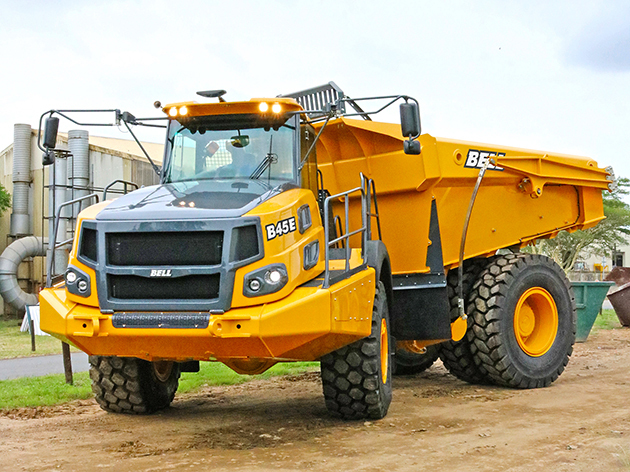 The new B45E 4x4 introduces the conceptual advantages of Bell Equipment’s two-axle ADT to the 40-tonne payload class. The 25m³ rock bin of the Bell B45E 4x4 offers a low tipping height at crusher housings or in underground applications. The Bell B45E 4x4 is based on the concept of the larger B60E, which successfully performs in opencast mining and quarrying applications worldwide. 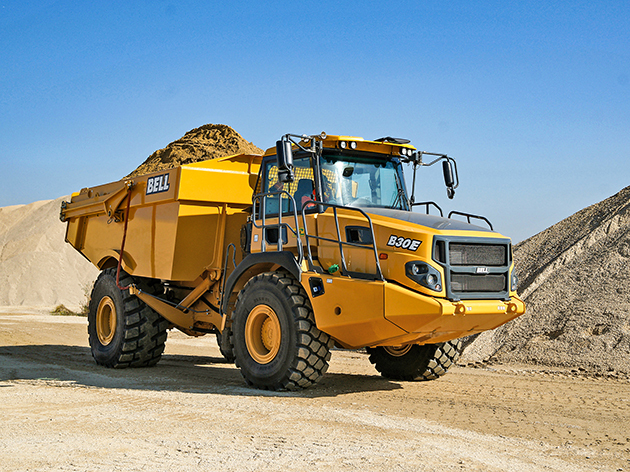 As third model, the thirty-tonner Bell B30E 4x4 completes Bell Equipment’s range of two-axle ADT. Tristan du Pisanie, Bell Equipment ADT Marketing Manager.